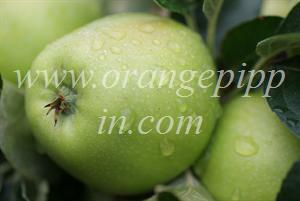 Morgan Sweet is one of those apple varieties that is very well-known in its local area, but nowhere else. It is usually catalogued as an early-season cider apple. The "Sweet" in the name almost certainly refers to its role within traditional English cider-making, where cider apples are categorised as bittersharp, bittersweet, sharp, or sweet. The apples are an attractive green/yellow colour, and the trees are large and vigorous. It was widely-grown in the cider-growing area of Somerset in the west of England in the early half of the twentieth century. Your author's own mother grew up in the nearby city of Bristol and had fond memories of eating Morgan Sweet as a child during the second world war. Like many of the comments on this page, she was surprised to learn it was supposedly a cider apple - at a time when fresh food was in short supply Morgan Sweet was a sweet and tasty treat. To modern tastes it is probably not that appealing, although it can certainly be eaten fresh. The ancestry of Morgan Sweet is unknown, but it was well-established in the Somerset area by the 19th century. It rapidly fell out of favour after the war, but the interest in cider-making ensures it continues to be grown by specialist fruit tree nurseries. Took a memory trip down 'Morgans' Lane today. Was sorry to see the Morgans Sweet trees and the old orchard had been long removed. Can still remember the excitement of the 'stolen' sweetness of that apple! Would love to be able to buy some now. Never found another flavour the same. As a child in the 50s,my siblings and I were lucky enough to live surrounded by an apple and greengage orchard in Martock. Over the hedge was a Morgan tree, the fruit of which we waited impatiently to drop in our garden! The best eater I have tasted until Discovery came on the market, but still has number one spot in my heart! I was reminded of the Morgan Sweet following a television programme on BBC4 yesterday about the march of the French Golden Delicious. In the 1960s we lived on a smallholding at Henton near Wells in Somerset. We had a two and a half acre orchard which we rented to a local farmer for his cows. The orchard had one tree, whose trunk grew at an angle of 45 degrees, which had lovely green apples. The farmer told me they were Morgan Sweets. I never realised that they were cider apples as they were different from the rest of the trees in the orchard which were. Nice to read so many comments on this old variety. When starting to plant a small cider orchard 10 years ago I happened on this variety and later mentioned it to an elderly aunt on my father's side, who informed me that before the War it had been my paternal grandmother's favourite eating apple. A couple of years later I had a similar conversation with an equally elderly uncle on my mother's side and found to my surprise that it was also my maternal grandmother's favourite variety! However, both uncle and aunt thought it was horrid. Both families came from the North Somerset coalfield and I like the (apocryphal?) story that the apple was bred as an early for miners to take down the pits for their lunch, with sufficient taste to cut through the coal dust. Interesting thread. We have three huge trees bearing a vast quantity of Morgan Sweet apples this year. Our neighbour, 92, remembers them being planted in the 20s and told us that the farms around here (Bruton) used to send barrels full of them to the quarries west of Shepton Mallet. One of ours is a chimaera with a Bramley grafted onto it; one of the MS boughs broke in the wind a few weeks ago and so we had 5 barrowloads of apples. Have made a lot of juice and 30 litres of cider (75% MS 25% bramley) is bubbling away nicely. We are not overkeen on the taste, which is very distinctive and if under-ripe tastes of very little. The window of perfectness appears to be very short. They really do not keep for more than a week. I attended West Horrington Infant School (near Wells in Somerset) in the late 40's/early 50's and a local farmer, Mr Hodges, from East Horrington, would bring a supply of this wonderful apple into school. He had probably had enough of us youngsters scrumping them - he even put geese into the orchard..... But I will never forget the flavour - sheer heaven! I haven't tasted anything like it since. I would love to know where I could buy some. I would happily send you some, but there doesn't seem to be any blossom this year on mine. That should mean a bumper crop next year, but September 2011 does seem like a long time to wait, doesn't it? As a young boy I was often sent to queue for whatever people were standing in line for, be it potatoes, carrots, of other vegetables. We did not see bananas, oranges, grapes or lemons, etc., from 1939 until a year or so after the war ended in 1945. Just now and again I was able to get a few apples. They were shaped like a pig's snout and my mother told me they were Morgan's Sweet. Oh! Boy! I would certainly queue for a pound of 'em now! It's more than nostalgia. It's not because we were deprived of fruit, especially apples that I loved the Morgan's Sweet. They had a flavour once tasted could never be forgotten. I enjoy Spartan apples nowadays, but they too have such a short season.. Please could some kind orchard keeper contact me in September when his/her Morgan's Sweet will be available. I'll pay over the odds for a couple of pounds, plus postage. Thanks. M.L. I have several huge ancient Morgan Sweet trees in South Somerset, and I get visitors every autumn who have childhood nostalgia for the taste. 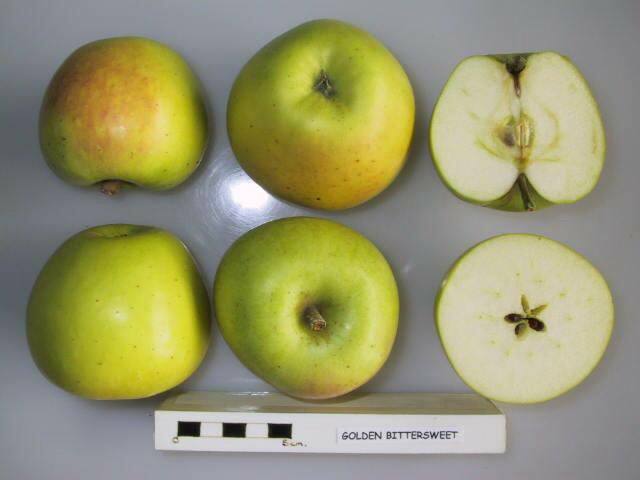 They don't have any redness about them, similar to a golden delicious in appearance. They ripen quite early, in September at the latest and used to be biennial, though mine seem to be fruiting every year this decade. Very vigorous, they're been mistaken for perry pear trees and grew to about forty feet high till we decided to crop a winter's firewood by bringing the highest branches down to ten feet from the ground. They took that in their stride and are now thriving, despite being hollow-trunked and full of mistletoe. They were very mature trees in photos taken in the 1940s, I think they must be about 100 years old now. Showerings used to take the fruit for Babycham in the 50s. My dear father and mother during their childhood in the 1920's fondly ate Morgan Sweet apples in preference to all other varieties because they were cheap and sweet. They would purchase them from fruit shops -- barrel boys did not usually sell them -- for 1d each ( half a new penny) Much later in the 1960s my father often lamented their disappearance and other kinds of delicious old apples too when commercialism indoctrinated young people to accept the new tasteless varieties. My mother, who is still very much alive and 95, would buy Morgan Sweets ( and blood oranges) with her very precious pocket money, seldom chocolate or sweets. I have just tried cider made of Morgan Sweet,and was very impressed. My wife and I are attempting to grow some fruit trees and are toying with the idea of growing some Morgan sweets possibly making some cider,if not using them for eating . We are total novices,and will accept any advice given,gratefully. When we were young, in Bristol, about 1941 we cycled with our Dad to Severn Beach/Aust area where there was a big orchard of Morgan Sweets. We filled up with sacks of apples. mostly fallers, not too many wasp damages and very cheap, then all cycled back to Bristol St. Pauls with our booty. The apples didn't keep and were consumed rapidly by the entire family. I can still taste them today. I remember eating Morgan Sweets as a child in 1948. The tree was in an orchard at Over near Almondsbury, just north of Bristol. The orchard disappeared many years ago. The taste was indeed sweet, pleasantly distinctive and slightly dry on the tongue. I have never tasted an apple remotely like it since. I am a little surprised that it is considered solely a cider apple. My Mum remembers Morgan Sweets from her childhood and loved this variety. Does anyone know where I can buy some for her, she could do with cheering up. In a mixed orchard of cider apples down in Somerset during the war it was always the Morgan Sweets that I went for, as a child. Pale golden skins, tapered shape and very sweet in taste. A treasured memory. I haven't tasted Morgan Sweet as an apple but the cider made from this variety is out of this world. Luckly we have Perry's Cider not far from us at Dowlish Wake, where we can buy bottles of this exquisite drink! I remember these from the 1940s. They were medium size and had a bitter sweet taste which I did not like. About to make a quantity of Morgans Sweet cider (5 - 10 galls) small scale. But will keep you updated on progress and results. 2006 cider making 10 galls was very good - made from any apple available. Experienced makers very impressed with results.